This long-lasting setting spray is inspired by Backstage makeup techniques. A genuine glow booster and skin perfector, the Dior Backstage Airflash Radiance Mist gives radiance and vitality to the complexion immediately upon using. 100% of testers* found that their makeup was more resistant to melting, cracking, sliding, and fading . *Consumer test, 64 subjects, 1 month. 1- Prep: Dior Backstage Airflash Radiance Mist instantly fuses with the skin, leaving it fresh, soft, and ready for makeup. 2- Set: Long-wearing, it ensures makeup stays beautiful with a weightless effect for a radiant finish that lasts. 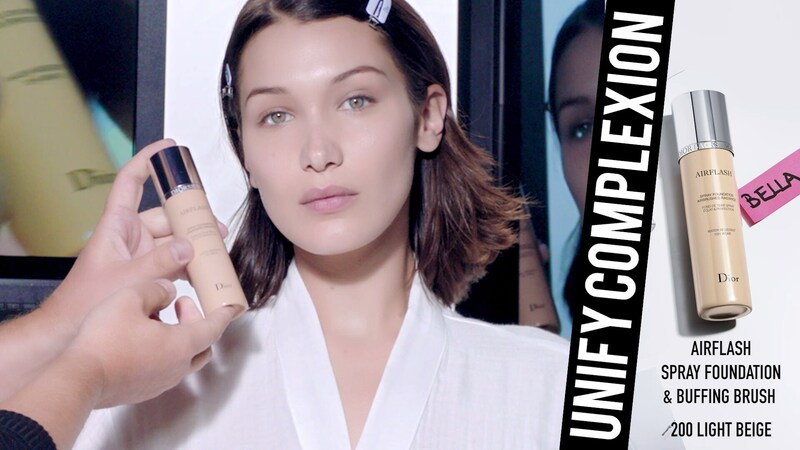 3- Refresh: Light and convenient, Dior Backstage Airflash Radiance Mist can also be used for touch-ups throughout the day to restore radiance to tired, dull complexions. 1. To apply Dior Backstage Airflash Radiance Mist, shake for five seconds before use. 2. Hold 8 inches (20cm) from face, close eyes and spray over the entire face in a Z pattern. The formula uses a micro-diffusion technique to set makeup. Light-enhancing pigments help revive the complexion's glow, while hyaluronic acid maintains hydration for skin that appears plumped with each use. Dior Backstage Airflash Radiance Mist is available in 1 formula suitable for most skintones. #13301/A BUTANE ● AQUA (WATER) ● PROPANE ● METHYL TRIMETHICONE ● PHENYL TRIMETHICONE ● ALCOHOL ● DIMETHICONE ● ISOBUTANE ● SILICA ● BUTYLENE GLYCOL ● MICA ● ACRYLATES/DIMETHICONE COPOLYMER ● CETYL PEG/PPG-10/1 DIMETHICONE ● GLYCERIN ● PHENOXYETHANOL ● PARFUM (FRAGRANCE) ● ALUMINA ● PEG-10 DIMETHICONE ● HYDROXYETHYLCELLULOSE ● LECITHIN ● SODIUM HYALURONATE ● DISTEARDIMONIUM HECTORITE ● SODIUM MYRISTOYL GLUTAMATE ● LINALOOL ● LIMONENE ● ARTEMIA EXTRACT ● ALUMINUM HYDROXIDE ● CITRONELLOL ● MAGNESIUM ASPARTATE ● ZINC GLUCONATE ● TIN OXIDE ● POTASSIUM SORBATE ● BHT ● COPPER GLUCONATE ● TOCOPHEROL ● PENTAERYTHRITYL TETRA-DI-T-BUTYL HYDROXYHYDROCINNAMATE ● [+/- :CI 19140 (YELLOW 5, YELLOW 5 LAKE) ● CI 42090 (BLUE 1 LAKE) ● CI 77007 (ULTRAMARINES) ● CI 77163 (BISMUTH OXYCHLORIDE) ● CI 77491, CI 77492, CI 77499 (IRON OXIDES) ● CI 77891 (TITANIUM DIOXIDE) ● ].